Text by Roger Brown, guest blogger. Check out his website. He wrote a fine piece on pyramid tents (aka “mids”) that we recently discovered, and so we asked him to write one for our blog. Thanks Roger. I have spent the last five summers hiking in the open treeless plains and mountains of Lapland, Finland. Two experiences led me to the conclusion that mids are the right option for me. First, I used a GoLite SL2 on an 18-day trip along the Nordkalotteleden in 2011. One evening as the wind began to increase and rain rapidly approached, I found a spot to pitch the shelter. Quickly, I had it pegged down and I crawled inside, extending the poles as the rain increased in intensity. It was then that I realized the benefits of a mid compared to a framed (or hooped) shelter. A couple years later while carrying a different shelter with a single hoop, I stopped for a break at a nice campsite near a river. As I rested, a fast-moving storm came in. It was way to early to camp, so I didn’t set up my tent. I spent the best part of an hour laying on the ground face down waiting for the storm to pass. It was then I realized I would never use a hooped shelter again. A mid works for me, especially when hiking above the treeline in Lapland, as bad weather can arrive quickly and last for a day or two. I saw my first mid in the early 70’s in Australia. 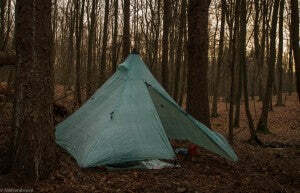 I was fascinated by it, but never took the step of investigating it, as I was happy with my basic A-frame tent. Times changed and tents with aluminium-poled frames appeared on the scene and whilst heavier, their main selling point was comfort and weather worthiness. Quick to pitch. I like square/rectangular mids for the ease of setup compared with a hexagonal based mid. A square based mid requires only four stakes to secure it to the ground. (More can be added later). Once staked to the ground, it is unlikely to “fly away” and it is easy to crawl in and erect the center pole. Your hiking poles can be combined to make a center pole. I use Pacer Poles for hiking, which incorporate left and right handed handles. To use them as a center pole I disconnect the handle section of each pole and join the poles with an extra pole section, providing a rigid support for the center of the mid. Once inside the mid, there is ample floor space. An insert can be erected while protected from the weather. A mid provides a variety of sleeping options when traveling solo. 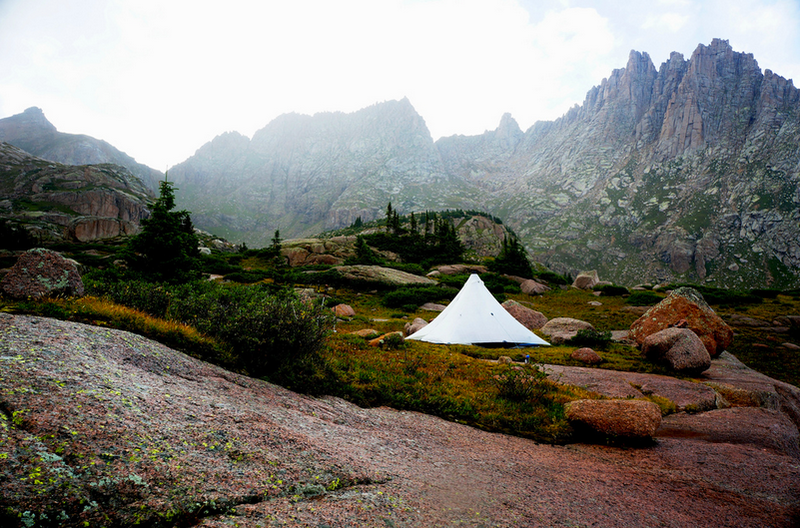 A mid packs easily and takes up less space in your backpack than a conventional framed tent. The versatility of a mid, combined with its low pack weight for space, has brought me to the point where I will only use mids on long trips in treeless environments. Check out our UltaMids and Mid Inserts on our website. Weminuche Wildernerss, Colorado. Photo by Mike St. Pierre. The post Mids Make Going Light Easy appeared first on Hyperlite Mountain Gear Blog.